Sherman McCoy wore leather boating moccasins with a checked shirt and khakis. Nestor Camancho wore a too-small cop uniform to accent his muscular physique. And Roger White, wooah-boy, Roger White wore a navy pinstripe suit, a contrast-collared shirt with a white collar and pale-blue stripes down the front, a crêpe de chine silk tie from Charvet in Paris, and polished black cap-toed shoes. The particular outfits these men wore, and the men themselves, sprang from the fertile mind of Tom Wolfe, who sadly passed away earlier this week. Much has been written about Wolfe, about his unique prose, his reporting-style approach to fiction and his literary-style approach to nonfiction, and, of course, his white suits—Entertainment Weekly even put together a rundown of his best ones. But just as his own fashion is memorable, so too is that of those he wrote about. Clothing is mentioned so often in his works, that it seems a Wolfe character introduction is not complete without a thorough account of the subject's ensemble. My replications of his descriptions above are barebones. Wolfe went into much fuller, much deeper detail, full paraphrases or quotations of which would have taken up substantially more space. And like everything Wolfe did in his writing, he had a reason for doing so. The classic advice for the wannabe fictionalist is to "show and not tell," and with clothing Wolfe found a particularly clever way to do just that. He took clothes, such a basic part of life many authors don't even consider worthy of mention, and used them to explain his characters, to reveal or drive home elements of their personality. The descriptions I opened with are more than just a report of characters' outfits, they're descriptions of the characters themselves. Of the WASPy McCoy, the vain Camancho, and the fastidious and slightly snobby White. In a Wolfe piece, fiction or nonfiction, even the most modest of clothing is revealing. What Wolfe understood well, perhaps better than any other writer and certainly more so than any other journalist, is that clothes speak volumes about their wearer. He described clothing as "a wonderful doorway that most easily leads you to the heart of an individual." A person's outfit is comprised of decision upon decision, regarding a host of attributes like style, cut, and color. And ultimately, those choices reflect the tastes and personality of the individual who makes them. So it's understandable that instead of saying John Smith, the Yale-educated reporter in Back to Blood, was wearing khakis and a blazer when he was called into his editor's office, Wolfe takes us through as many of Smith's dressing decisions as he can, writing, "he wore no necktie, but he did wear a shirt with a collar, in his case a white button-down shirt … not only that, he wore a navy blazer—could that be linen?—a pair of khaki pants freshly pressed with a crease … and a pair of well-polished dark-brown moccasins." (The ellipses are my addition.) The description gives the reader a greater understanding of the preppy and detail-oriented Smith. Wolfe's attention to fashion is found in his nonfiction as well. In Radical Chic, Wolfe's long-form article about a party Leonard Bernstein held for the Black Panthers way back when, there's an entire passage dedicated to the question of what one wears to a party honoring radicals. The trick, Wolfe writes, is not wearing something "frivolously and pompously expensive," while also avoiding anything too "funky" that gives the impression of slumming it. Just as he embedded meaning into the dress of his characters, Wolfe searched for it in the guests that night. Jean Stein's "rust-red snap-around suede skirt" showed she was trying too hard to be "funky," making too desperate an attempt to show her hipness. Felicia Bernstein, on the other hand, had the perfect outfit for the occasion: "the simplest little black frock imaginable, with absolutely no ornamentation save for a plain gold necklace." Her outfit was the most fitting for the (admittedly ridiculous) occasion because it most embodied the idea of radical chicness, of making a show of anti-establishmentism while still, of course, not straying too far from establishment ideals. Wolfe did an interview with TIME in 1989, in which he stated clothing was "the way [people] reveal themselves." His interviewer then posed a clever question: "What would you say about a character who wears a handsomely cut vanilla-colored suit on a winter day in New York, with a lilac tie and matching striped shirt with a collar seven stripes high, and shoes custom-designed to appear to have white spats?" He responded, "I suppose I might say, ‘Here’s somebody who’s trying to call attention to himself.'" And indeed, there are few outfits he could have worn to better achieve that goal. The white suit set him apart, making him look every bit the eccentric artiste. Wolfe knew full well the impact it had on peoples' perception of him, and he embraced it. He explained that the suit made him oddly disarming, "a man from Mars, the man who didn't know anything and was eager to know." Aside from this benefit to his journalism, he said he wore white suits because "it really irritated people." The singularity of Wolfe's style extended beyond the white suit, however. He had a penchant for loud patterned ties, homburgs, and collars so high they almost rose to his chin. But even less noticeable aspects of his outfit stand apart. Jonah Goldberg once noted Wolfe was probably "the last guy in Western civilization who uses cloth buttons [on his suits]." And those buttons would be real buttons on the suit jacket sleeves, ones with real buttonholes—he even wrote a whole article on the topic called "The Secret Vice." In all, Wolfe's clothing was a doorway that led to his heart. It reflected the fact that he was unafraid to stand out, yet traditional that he reveled in his role as a contrarian and that he paid sharp attention to details, especially those few noticed. Charlotte Simmons wore high-waisted jeans, a printed cotton blouse, and white Keds. Maurice Fleischmann wore an eight-thousand-dollar silk suit with a French-cuff shirt. Leonard Bernstein wore a black turtleneck under a navy blazer, along with plaid trousers and a long pendant necklace. 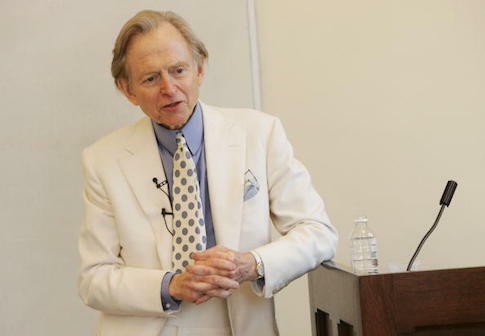 And Tom Wolfe wore a white suit.